Highly influenced by her Indian heritage and frequent trips to the country, Saira Hunjan's work often depicts images of nature, animals, and goddess figures. Her medium of choice is ink, which she has applied to both paper and skin. Known internationally as the Girl with the Golden Needle, Saira came to prominence in a career as a tattooist whilst studying fine art. This experience helped her refine and transform her visual language for her creative practice. Saira's connection to animals continues to be a great inspiration in her work. A proportion of the profits made by selling Saira's art will go to a charity in support of animals in Rajasthan, India. The work done by Tolfa India is very close to Saira's heart, as they provide shelter and medical support for animals in need. 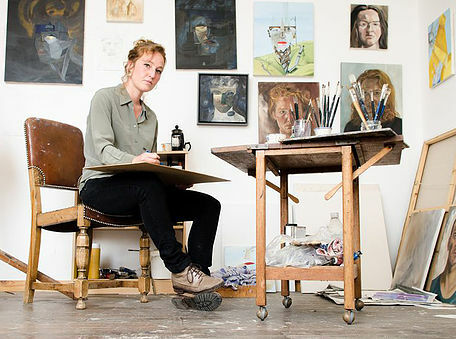 Miranda was a fine art oil painter who lived in Hornsey, North London from 2006 – 2015. Her life was tragically cut short in 2015 due to a heart attack, at the age of just 32. She was a woman like no other, loud, energetic and playful. Always attracting attention with her self confidence and sense of humour and loved by all. Due to her rebellious nature a traditional path through art school did not suit Miranda, she attempted and succeeded to break into the London art scene the hard way. Fortunately she had an inquisitive and insightful mind, a skill honed from a young age with pencil and brush, and moreover a drive and determination to succeed. Miranda never produced art to be purely aesthetic or popular, but to challenge, question and express herself. A proportion of the profits made by selling Miranda's prints will go towards a fund set up in her name to raise money to help young people in need through Art and Music. This is centred around local communities in Dartmouth, South Devon, and intends to help children from more deprived backgrounds and those with mental health difficulties. Dafydd's main sources of inspiration lie in the divination, tree spirits, symbolism, faerie folklore and the 'otherworld' when creating all of his art. In recent times whilst trying to paint one thing based on a simple idea, Dafydd has been taken over by an energy that reveals itself as a busy flow of orbs, lights and the occasional faces, which he believes are elemental spirits. Dafydd's recent paintings have become doorways or portals as well as oracles; like ancient trees. They have become useful functions when you sit before them in meditation, changes occur as they are imbued with energetic keys and codes, which have been shown recently to have an effect on the consciousness. It has taken a long time for these energies to come through in his art and he now sees it as a new beginning. Dafydd is glad to not have to think at all about ideas or techniques anymore, instead is free to let the art make itself through him.